One of the first considerations when you are planning your kayaking outing is wind speed. It can determine a pleasant outing or conversely a strong workout. Being familiar with the prevailing wind patterns in the area you are kayaking is of primary importance to the safety of any kayak outing. The Victoria area has prevailing winds from the SW that tend to build in the afternoon and evening. If the wind is blowing from a different direction that may mean the barometric pressure is changing and could bring a weather system through. Be sure to have accurate weather sites that can give you marine wind forecasts for the area you are paddling. We like to use bigwavedave.ca. It is primarily a surfing site but the information is quite accurate. It also gives you tidal and current information for many sites around Vancouver Island. The wind has specific implications for kayakers. 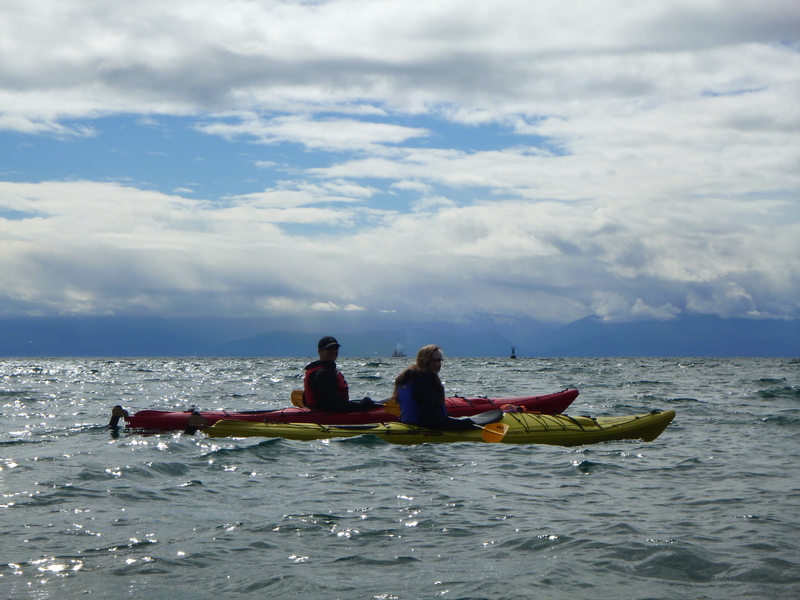 Each kayak is designed to move into a “head to wind” position – bow forward. This may result in corrective paddling to keep your kayak on course. This is where a rudder is really helpful. It can prevent injury over long distance paddling trips, as it helps you keep even, cadenced paddling strokes while your feet steer for you. Having good bracing techniques, both high and low, will keep you balanced and upright in heavy wind and wave conditions. When the wind is opposing the tide the waves will be steeper. Checking tides and wind and determining all protected areas – or the “lea” side, and using the wind and tidal direction to help you paddle, is the homework all paddlers do before they ever leave the house to go kayaking. We wish you calm seas and maybe a little wind for fun every now and then! !